The latest lesson of the food photography course I’ve been following along with is up. As it happens I’d been reading C’est Moi Qui l’ai Fait, and noticed a recipe for cake au citron très citron, version mini. Well, I love lemons, I still had a naked one in the fridge from the limoncello, and they sounded like a good photo opportunity, so off I went. They are very easy to make and turned out beautifully: light and moist (if not very lemony in my case through a shortage of zest; I had another small lemon but it didn’t produce much zest). Ideas for variations: lemon icing, or maybe a blob of lemon curd in the middle (I didn’t have any, or I would have tried this to make up for the lack of zest). Pascale’s pink silicone mould is prettier than mine, but I was still quite pleased with the photos, as I just did them quickly. Beat together eggs and sugar with an electric whisk until thick and pale. Beat in the cream, then the flour and baking powder. Beat in the butter, then the oil, and finally the lemon zest and juice. 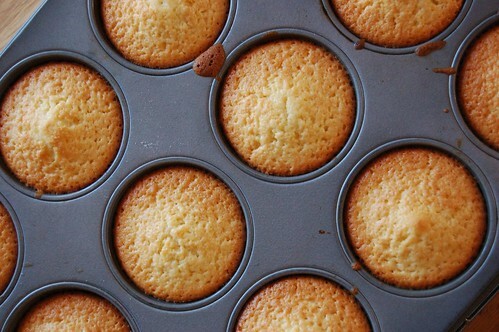 Butter a muffin tin and 3/4-fill each mould. Bake for 20 minutes, then test with a skewer or thin-bladed knife, returning to the oven for 5 minutes if not quite cooked. Leave to cool slightly in the tin, then carefully loosen with a palette knife and cool on a wire rack. Will keep several days in a sealed container. fantastic! that first image is wonderfully powerful, lots of energy. They look very nice. 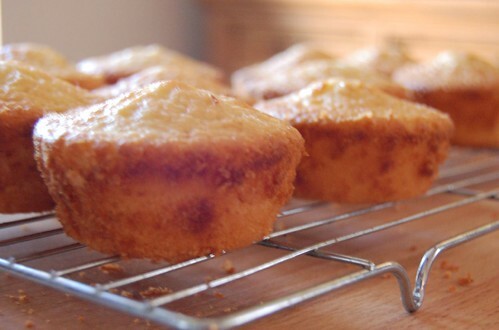 If you want them to be more lemony you could brush them with a mixture of sugar and lemon juice just when you remove them from the oven, like we do with the lemon drizzle cake in uk. Yes! That’s exactly what I did with a few of them, and it added a nice lemon tang. I think a blob of lemon curd would be good too.